Our private GP‘s at LDC are all fully-qualified and experienced in all aspects of medicine, including gynaecology. Should you have any such gynaecological concerns, our GP’s are able to manage many basic gynaecological conditions, and are trained in recognising any red flags for more serious conditions. Whatever your concern, our doctors can provide advice and reassurance, arrange any further investigations, and refer to/ liaise with a specialist, if necessary. The ovaries are a pair of female reproductive organs. They contain and release an egg each month, in a process known as ovulation. Ovulation is a monthly process, and in many cases, the egg that is released is fertilised by the male sperm, resulting in a pregnancy. The ovaries are situated in the pelvis, and are attached to the womb by a pair of fallopian tubes. As with most other parts of the body, cancer can affect the ovaries, and it is most common in women who have been through the menopause. It is the fifth most common cancer in women, after breast cancer, bowel cancer, lung cancer and womb cancer. All cancers begin in the same way. There is a mutation in the genes of the cell, which disrupts the messages and signals for growth and repair that the cell receives. This results in the cell growing out of control, and reproducing extremely quickly. The result is the formation of a tumour. Endometriosis: this is a condition causing pain, abnormal bleeding and fertility problems. It occurs when cells that usually line the womb grow in places where they shouldn’t, such as the bowel. 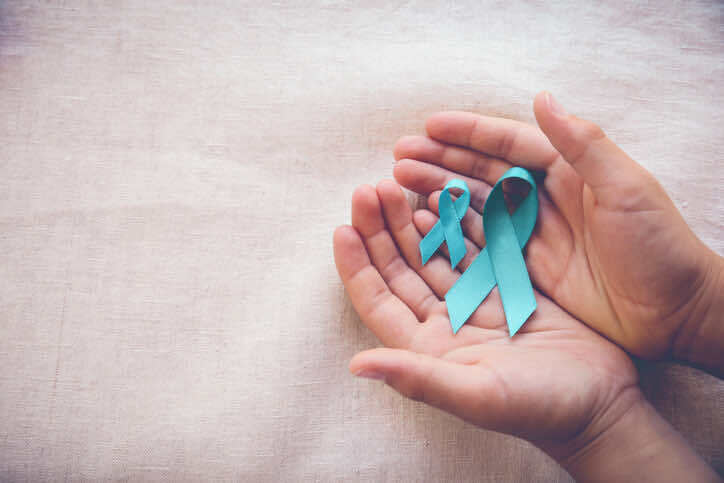 One of the biggest issues with ovarian cancer is that the symptoms of it (particularly in the early stages) often mimic the symptoms of other, less serious conditions, such as pre-menstrual symptoms or Irritable Bowel Syndrome. There are, however, some symptoms that you should watch out for, especially if you have any of the risk factors we have described in the previous section. Sometimes women with the disease experience back pain and changes to their normal pattern of urination, such as needing to go more frequently or more urgently. Diagnosing this type of cancer can be difficult, as it often presents similarly to other (manageable) conditions, or presents at a later stage. If you are experiencing any of the symptoms we describe above, you should make an appointment at your doctors surgery as soon as possible, as it’s best to be checked out. Keeping a diary of your symptoms may help inform your GP as to how long you have been suffering, and the effects of the symptoms on your daily life. Your GP will want to ask you lots of questions about your symptoms, your family and personal health history. They may want to examine your abdomen and your reproductive system. They may do some tests, such as blood tests, or an analysis of your urine or a stool sample to rule out other possible causes of your symptoms. If your doctor has concerns about you, he or she may first perform a special blood test called a CA125. This is a chemical found in blood that is released by ovarian cancer cells, and it may be raised in some women who have ovarian cancer. These are imaging tests that allow the doctors to see (and take pictures or sample) of your ovaries. Many women who are diagnosed with ovarian cancer will undergo surgery. There are many forms of surgery that you might have, and which one is right for your will depend on the location and stage of your cancer. If the tumour is confined to one or both ovaries, you may only need to have these removed. The surgeon may also remove the glands from the pelvis and abdomen. They may also take samples of nearby tissue and send it to the laboratory to see if the cancer has spread. This may follow surgery to remove the cancer, and it involves using anti-cancer drugs to kill cancer cells in the body. Most women have six cycles of chemotherapy, with a break in between cycles. Radiotherapy used high energy x-ray beams to kill cancer cells. It is not often used for ovarian cancer, but it might be indicated for use under special circumstances such as to relieve symptoms like bleeding or pain. Ovarian Cancer: What Is The Outlook? As with most types of cancer, the prognosis is variable, and depends largely on the location, size, and spread of the cancer. Your general health and age are also factors that may affect your outlook. Ninety percent of women who are diagnosed with Stage 1 (early stage) ovarian cancer will still be living five years after their diagnosis. If you’re concerned at all about ovarian cancer, or any other gynaecological issue, please know that our GP’s at London Doctors Clinic are here to help. We have eight London clinics, so should always be able to help you out when you’re in need of a doctors surgery or “GP near me“. And, if you’d specifically like to see a female GP, just give us a quick call and we’ll ensure your appointment is booked in with one of our female doctors. If you have any concerns, it’s always best to get checked out by a professional, for the reassurance or investigations you may need.